Before I got into vintage quilts, I collected old Beacon style blankets, and for years I kept them safely tucked away in storage boxes. Not anymore. Life's too short to keep the stuff you love the most packed away where you can't enjoy it, especially when it's something as useful as a blanket. I call my blankets Beacon style because I'm not sure of their pedigree. 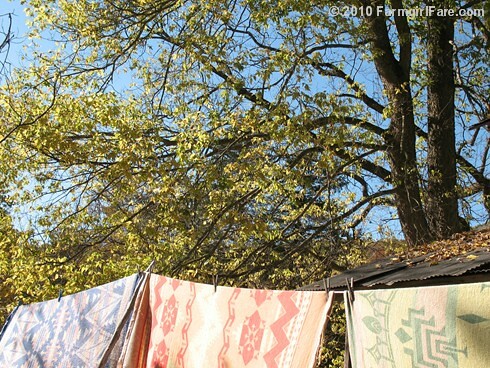 According to this great slideshow from Country Living magazine, from 1920 through the 1940s, The Beacon Manufacturing Company was America's largest cotton-blanket maker, pitching its product as a modern marvel: a fluffier, less expensive, moth-proof alternative to wool that was easier to clean and just as warm. here. There's even a book out called Beacon Blankets: Make Warm Friends. Just looking at my beautiful everyday treasures always makes me happy, and curling up with one is pure cozy comfort. Some of them are already worn thin in spots—a sign that previous owners didn't think them too 'good' to use. I now keep them on the bed and scattered around the living room nearly all year round. When I ended up in the ICU for several days last summer, one of the few things I asked Joe to bring me from home was my softest vintage blanket to lay atop my hospital bed—and it made all the difference. What special possessions do you use every day? © 2010 FarmgirlFare.com, the classic foodie farm blog where next up is unearthing the fabulous set of 1930s Art Deco silverplate I've owned for about 20 years but never used that I know is buried around here somewhere. It's time for it to become our everyday flatware, because who or what am I saving it for? We eat so well on the farm (tonight's dinner: homegrown grass fed Angus roast beef studded with chunks of onion, boiled and buttered red potatoes, and a salad of freshly picked baby Asian greens with homemade buttermilk ranch dressing) that every meal becomes a special occasion, deserving to be eaten with something special. We don't use it every day, but we try to use our nice china often. I love its Japanese branch border! Why save it just for holidays? I love your blankets! Why are they called beacon blankets? 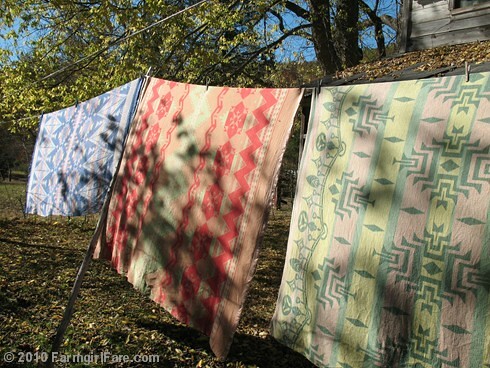 I collect old bedspreads, blankets and eiderdown quilts over here in England. The eiderdowns are quite small, usually in a floral pattern and were used to lay on top of blankets for extra warmth. I have a few wool blankets without any intricate patterns. The bedspreads I have are mostly from the Fifties and Sixties and are in cotton. I couldn't agree more. My rule of thumb is to not stash things I don't use. If it doesn't get used, unless it's a treasured family heirloom neatly tucked away, I give it away. I use my Lenox dishes all the time. Those blankets are gorgeous!! 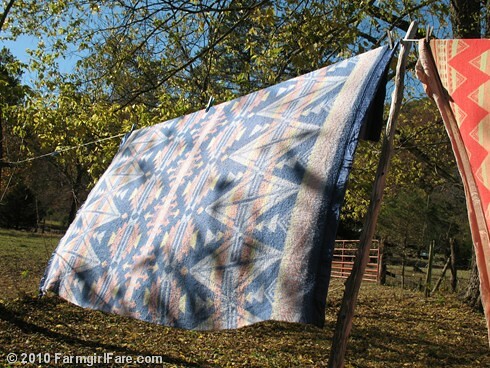 I'm not familiar with Beacon blankets, but I think you have quite the treasure - beautiful! I agree about using the things you really love - who deserves to use them and enjoy them more than the people you love? I'm trying to do more of that. Really, what are we 'saving' these things for? When you find the flatware, please post some pictures - I'd love to see it. They're called Beacon blankets after The Beacon Manufacturing company, which used to be the biggest blanket maker in the U.S. 'Beacon' has become a generic term for all similar blankets. 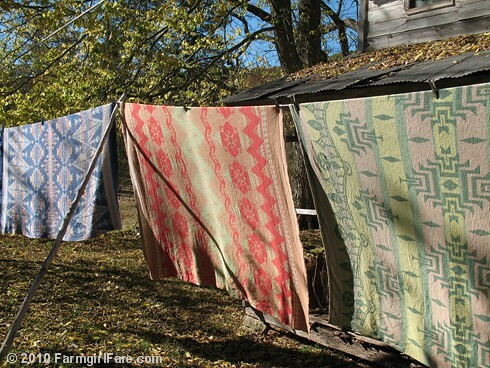 Your question inspired me to go back and add some more information and links to great photos of Beacon blankets in my post that you might enjoy. Thanks! I love the handles on your rolling pin - and your homemade tortilla looks delicious! I really need to make tortillas more often - they're so easy and yet taste so much better than storebought. I'm slowly but surely working on more posts about all of the vintage things that make me so happy. And I think we are going to find a LOT of missing treasures as we make the move out of The Shack. I've been looking for some stuff for years, LOL. Awesome, if it can't be used lovingly it's not worth having! Susan, I am so excited that you visited my site... you don't know it but it was originally YOU who inspired me to start my own little blog... thank you so much. You're the best! Oh I am obsessed with Fire King jadeite dishes. They can be very pricey - my mom bought me six salad plates and a batter bowl for my birthday a few years back. I use those salad plates everyday! Funny thing though - I near have a heart attack if my husband drops one of those plates awkwardly in the sink, which he has done many times. After all that - last summer during our move - who broke one? MY MOM, who gave them to me in the first place!!! I couldn't really get mad at her, now could I?!?! You are so right - if you love something, you should use it, otherwise, what is the point in having it? I love that you use your vintage things. The rule at our house is nothing comes into the house that we don't or cannot use. I have many many antiques and vintage items and I love to use them all. Afterall life is too short to not get enjoyment out of your surroundings. Love your blog. Check out mine at www.carolinaheartstrings.com. It is all about the Carolinas! I love your blankets. I remember seeing and having some of them. The cotton seems much warmer, sometimes, than wool. I did weave a blanket in 100% cotton for a young friend and she carries it everywhere that she travels. It's heavy, warm and washable! It rarely is on her bed ... usually around her when she's trying to get warm. Beautiful, glad you are putting them to use.